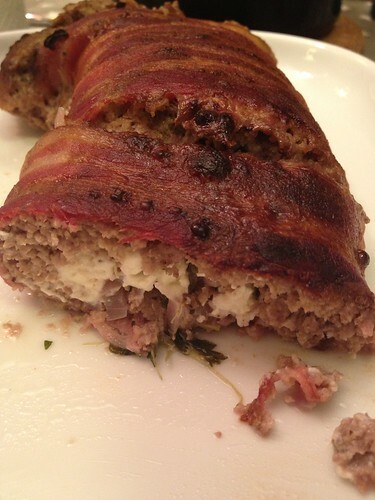 This is actually quite fancy - it's a bacon-wrapped lamb meatloaf stuffed with feta cheese, thyme and red onions. It doesn't look like much, but really, meatloaf? Not the most photogenic dish in the world. Taste-wise, it more than makes up for it. I served this with boiled potatoes and gravy, but mashed potatoes would have been even better. I have a mash-hater in my house so sadly, it's never an option for me. Mix the breadcrumbs, milk, salt, pepper and egg and leave for five minutes. Add the lamb and mix well. Let it sit for another ten minutes. Place the bacon slices close together on baking paper or a silicon mat, in a square shape. Spread the meat mixture all over it, and sprinkle with the toppings. Roll up, like you would a sushi roll. Roll tightly! Place, seam-side down, on a baking tray, and bake at 200°C for about 30 minutes. A mash-hater? I can hardly believe such a person exists! This sounds so delicious!